You owe every Liverpool FC fan the world over an apology. More importantly, you owe the families of the ninety-six men, women, and children who died at Hillsborough a massive apology for your insensitive and boorish editorial that labeled one of international football's greatest tragedies a 'soccer riot,' essentially committing the same crime as The Sun did more than two decades ago, blaming the fans for their own deaths. This was not a riot, and to call it one is unacceptable and disgraceful. Not only is this simply wrong, it is shoddy journalism. The Taylor Report exonerated the fans and blamed the local police force, which has never admitted its culpability nor punished those who failed so spectacularly in their duty to serve and protect. It was obvious to any footie fan than you know nothing of the sport. Your comments have garnered words of support from fans of Manchester United and Everton, our greatest rivals in the game, as well as fans the world over. Having been faculty advisor to a local high school newspaper, I must say your execrable skills as a journalist would not have been tolerated by any of the student editors with whom I worked. Having spent eighteen wonderful years living in Boston, starting with my undergraduate years at BC, I was ecstatic to learn that my beloved Red Sox and New England Sports Ventures under John Henry would be purchasing Liverpool FC from the disaster that was Tom Hicks and George Gillett. Now to see my adopted hometown's newspaper of record committing the nearly unforgivable sin of blaming the Hillsborough 96 for their own deaths, for that is what you did in calling this tragedy a riot, is heart breaking. After all we local LFC fans--especially members of the Boston Liverpool Supporters Club--have done to promote Boston as a sports town to our European compatriots, I am completely deflated. In a town that boasts the Red Sox, the Celtics, the Bruins, the Patriots, and the Revolution, I would expect a soupçon of understanding and compassions for sports fans who died supporting their hometown team. I call on all Liverpool FC fans and all sports fans of good will to join me in boycotting the Boston Globe and its advertisers until an official apology is offered by you Mr. Beam and you editors. Freedom of speech and the press does not give you the right to distort history nor insult a city and it inhabitants, a football club and its fans, or the biggest international sport in the world. 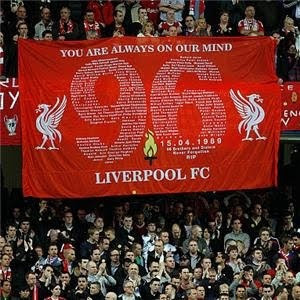 To the Hillsborough 96 and their families, on behalf of my adopted hometown, I apologize. Please do not let Mr. Beam represent in your mind this wonderful city of passionate sports fans. You deserve better than this. You'll Never Walk Alone.